Earlier today, we told you that a U.S. court ruled that Qualcomm must license its standard-essential patents related to smartphone modem chips to its competitors, like Intel. Previously, the company was offering these licenses only to smartphone manufacturers. These patents are essential to the production of a device so that the product can meet a technical standard. They are licensed using fair, reasonable, and non-discriminatory terms, known as FRAND licensing. Besides the lawsuit filed against it by the FTC early last year, which accused the chip designer of entering into an illegal anti-competitive deal with Apple for modem chips, Qualcomm has been sued by Apple several times. Just recently, Qualcomm accused Apple of owing it $7 billion in royalty payments that was due when the iPhone employed Qualcomm's modem chips. Among several issues between the two companies, Apple claims that Qualcomm's demand for a percentage of a phone's selling price to license a patent is not legal. With the new bred animosity between Apple and Qualcomm, all of the 2018 iPhones use a modem chip from Intel. 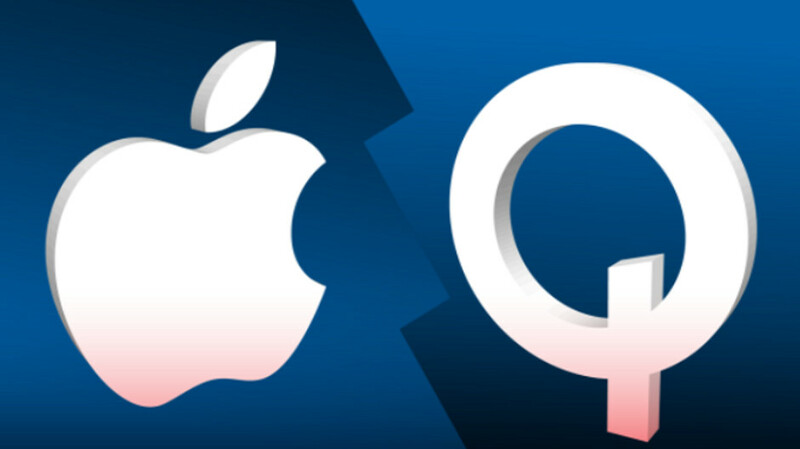 There has been some speculation that Apple and Qualcomm will kiss and make up before the end of this year, both agreeing to settle their legal differences out of court. However, as reported today by Reuters, Apple and Qualcomm have no plans to start settlement talks. According to a source inside Apple, the company is planning to take on Qualcomm in court. The case will head to trial early next year. Qualcomm CEO Steve Mollenkopf says, "We continue to talk. We also have a number of ... legal strategies that are in flight. And we hope that through the combination of either those paths, we could get to a resolution, and we’re confident that we will." There is no way Apple would settle with Qualcomm now, not when momentum is in their corner. I have some issues with Apple and their pricing but in this case with Qualcomm, they are right. Qualcomm is going to lose this case or settle for most of what Apple is asking for. I like iPhones, but I’m with Qualcomm. Apple agreed on terms and now they’re whining that it’s too much. Sorry - agreement is an agreement. You don’t like - move on, or make your own. I guest you are not paying attention. https://www.phonearena.com/news/court-ruling-forces-Qualcomm-license-standard-essential-patents_id110771 Qualcomm is penalizing companies if you do not buy their chips (snapdragon). Why should Apple buy sd chips from Qualcomm's when their A series chips are better? That's the issue with fanatics, they let their emotions drives them, the courts said otherwise. I’ve seen those. And I still disagree. No reason for name calling ! Apples fault doubting that their iPhones will sell this well. Either renegotiate, or uphold a contract. I would hate to make a contract with someone and then when they realize it didn’t pan out how they liked - they just bail? You must have never ran or oversee a business in your life. The problem with your theory is they are using Essential patents to do it. You can charge folks whatever you want as long as they are not essential patents. In this case the courts agree and there goes your theory. Both parties are in the wrong, Apple for refusing to pay contractually obligated licensing fees and royalties and Qualcomm, arguably, for charging Apple too much for licensing and royalties. I say arguably because Apple had no problem paying these agreed upon fees and royalties until they started using multiple suppliers for components and were stuck paying Qualcomm for iPhones that had no Qualcomm components. I can understand Apple's disagreement with the height of the licensing fees. The royalty agreement however, they stepped in with both eyes wide open, very willing because it was beneficial at the time and for that I can only say: Pay up Apple. Apple signed a contract, now pay up. Plain and simple - that’s the way it should be. Its funny how fanatics on forums are letting their bias guide them. Does not matter what any of you are saying the courts have looked at the case and found Qualcomm to be violating the rules and ruled against them. It was an easy case to called once you educate yourself about the subject at hand and look at it logically without bias, case closed. I agree. What Toukale is saying is this. Yes Apple signed a contract knowing how much cost and they agreed to pay. But if they are FRAND, Qualcsmm can only charge up to a certain price and the because QC overcharged them, it makes rue contract Apple signed null and void. Which legally is true. FRAND patents are usually tech thatbis requires for a product to work a certain way or meet a standard QC patents are required for these to work properly so they require fair licensing. If QC didnt fairly license them then they are wrong roo. But Apple sighed, they should be fore. To lay the value of what it is worth. In others worlds, Apple should still be paying something vs not paying anything.